We have never grown an edible garden and would like to start by growing some edibles in containers. What is the best way to get started? 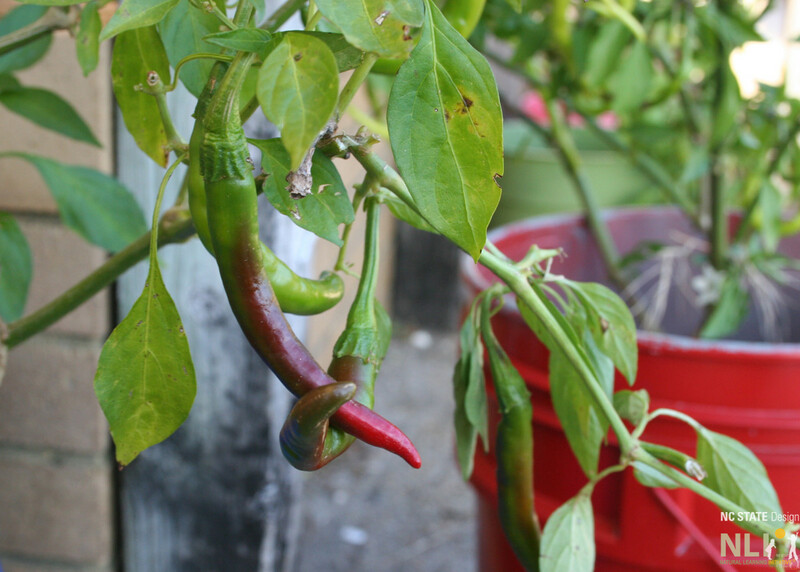 Container gardening is an easy, low cost, and child-friendly approach for growing fresh edible produce at child care centers. Children delight in growing and eating their own food and research shows that repeated exposure to healthy food options increases the likelihood of establishing healthy eating habits. Whether the center staff want to grow a few tasty herbs, a pot of strawberries, or lettuce and tomatoes for delicious salads, there are four keys for successful edible container gardening. Selecting containers: Edible plants can be grown in many different types of purchased, built, or recycled containers, as long as the container has adequate drainage and enough space for the mature plant(s), which is indicated on the seed package or plant tag. Think creatively about containers – a discarded dresser drawer, cooking pots, dish tubs, children’s wagons, and even shoes will work. Note: Edibles should never be grown in tires as toxins may leach into the soil and be absorbed by plants. Selecting the right edible plants: Many fruits, vegetables, and herbs grow successfully in containers. Page 3 of Be Healthy – Grow What You Eat includes a short list of edibles that do well in containers. For plants that typically need a lot of space, such as melons and pumpkins, a dwarf variety should be selected. For plants that climb, such as peas and beans, be sure to provide vertical support. Choosing the growing medium: The right soil is critical to the success of your container garden. Use a quality bagged potting mixture with the correct combination of potting soil and fertilizer to ensure that plants get off to good start and continue to thrive in containers. Using native soil in containers is not recommended because it may become compacted and will not provide enough nutrients to sustain plant growth. Providing the right growing conditions: For summer harvest, vegetables and fruits should be planted after the region’s last frost date. Different edibles grow best during different seasons, making it possible to garden year-round (Vegetable Planting Guide). All fruits and vegetables grown in containers require frequent watering to remain evenly moist and added nutrition, via liquid fertilizers, to ensure robust growth and production. Once edibles have been successfully grown in containers, consider growing them in raised planters next growing season. Invite the children to help plant, water, and tend the garden and you will be growing healthy children for years to come. Peppers grow in a repurposed bucket at Munchkin Academy, Buxton, NC. 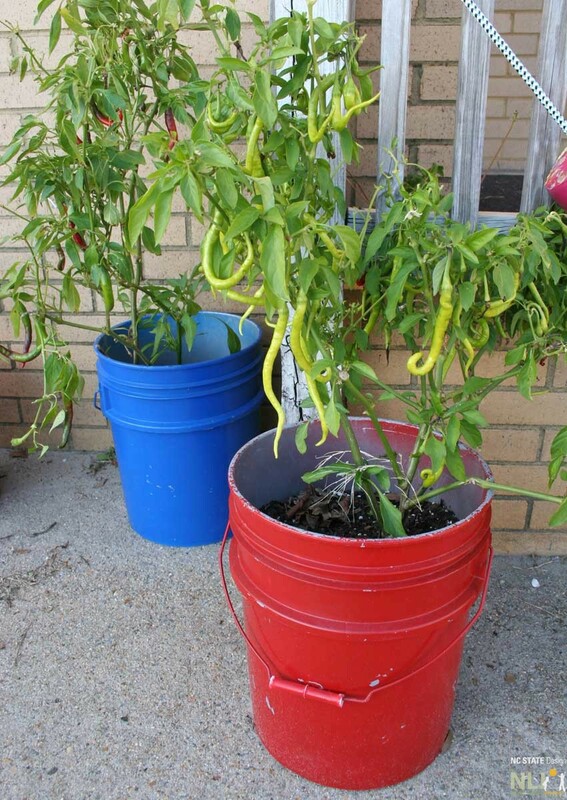 Peppers grow in repurposed buckets at Munchkin Academy, Buxton, NC. 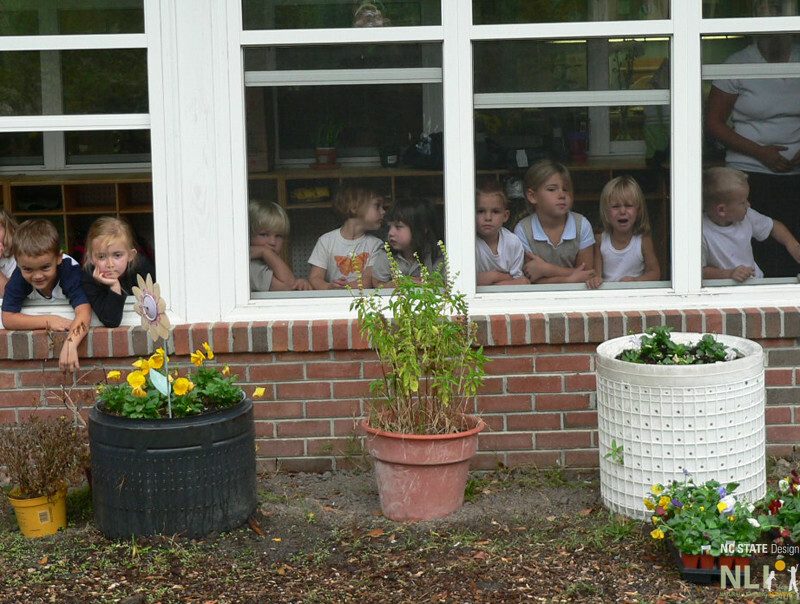 Edible herbs and flowering annuals grow in recycled washing machine drums at Montessori Children’s School, Jacksonville, NC. Container Gardening for Kids. Talmage, Ellen, Curtis Bruce. Sterling Publishing Company, April 1997. How to Create a Container Garden for Edibles in the North Carolina Piedmont. Richter, K. NC State University. North Carolina Cooperative Extension, 2012. Successful Container Gardens. Oguto, M., N. Pollard, J. Scherer, J. Shuster, and G. Stack. University of Illinois Extension. The Bountiful Container. McGee, R.M., Stuckey, Maggie. Workman, 2002. The Vegetable Gardener’s Container Bible: How to Grow a Bounty of Food in Pots, Tubs, and Other Containers. Smith, Edward C. Storey Publishing, 2011. Starting Seeds in the Spring.